On Friday, BBMP (Bruhat Bengaluru Mahanagara Palike) cleared KR Market of 2021 encroachments and dozens of unauthorised shops. 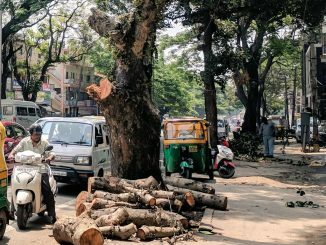 BBMP got together 390 personnel, 48 tractors, 15 lorries, eight compactors, eight earthmovers and 30 marshals, besides the traffic police, to clear the encroachments. The drive resulted in 240 loads of debris. Just a day before, BBMP Commissioner had inspected the market and promised to clear illegal constructions and footpath encroachments. The drive was in response a High Court directive on a PIL. 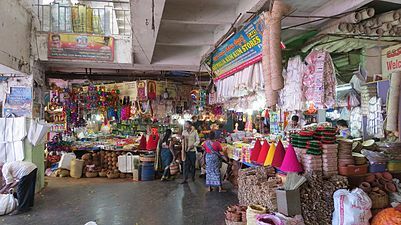 The Bengaluru Flower Merchants’ Association had filed a PIL in 2017, questioning illegal shops at the market blocking the entries to fire and emergency exits. During a hearing on the PIL on Wednesday, the court said it could order the closure of KR Market if serious lapses identified by the Fire and Emergency Service (F&ES) Department here were not rectified in couple of weeks. The bench observed that BBMP had not obtained a no-objection or clearance certificate for the market in the past two years, and that the BBMP Commissioner could be arraigned as prime accused if a fire broke out. The court also directed the Fire and Emergency Services Department, and BBMP, to inspect the market, execute the work and submit a progress report by April 3rd. BBMP has engaged an agency to soon audit all 164 Dry Waste Collection Centres (DWCCs) in the city. The audit will look at whether the centres require upgradation, better facilities or more space. The agency will also look at how the centres can be better equipped to recycle dry waste generated in the ward, and will draft an ‘implementable plan’ in two months. Meanwhile, about 10 DWCCs may be upgraded by a European company; the upgraded centres would have state-of-the-art equipment to sort dry waste into 20 different categories. Over the past fortnight, mixed waste has been dumped into an illegal landfill near Kundalahalli lake. Members of the volunteers’ group Kundalahalli Pathway said that security guards at nearby tech parks had been observing lorries and heavy vehicles dumping waste here at night. There are three families living in dangerous conditions at the landfill, picking waste. BBMP officials had earlier said they would issue notices to the landowners for permitting the landfill to come up illegally. D Randeep, BBMP Special Commissioner (Solid Waste Management), said that action would now be taken against both the landowners and those who dumped waste. On Friday, regular metro commuters protested at the Town Hall against the sudden hike in the minimum balance to be maintained on metro smart card. Bangalore Metro Rail Corporation Limited (BMRCL) had hiked the minimum balance requirement suddenly on Wednesday, from Rs 8.50 to Rs 50. The move had left many commuters stranded. Officials explained that the hike was to stop the problem of long queues at exit gates of metro stations. These queues are usually created when passengers with low balance recharge their smart cards at the customer care centres. However, protesters said that the hike was arbitrary, and unfair on the poor who depended on discounts. You can buy a villa for 3 crores in Whitefield suburbs, but not clean air! Whitefield outskirts where real estate is going north, have clean air in short supply. Indiscriminate burning of low value plastic stealthily in leased village lands here has affected villagers and gated community residents alike.